Getting it right! 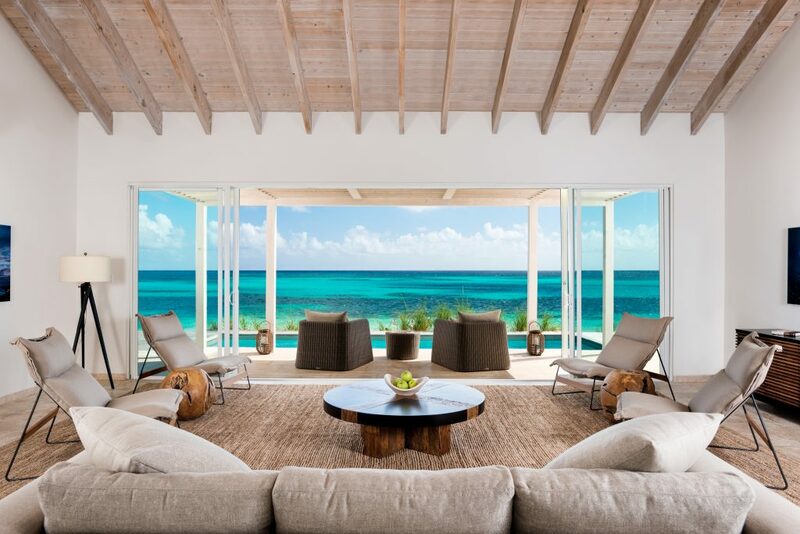 That about sums up everything you need to know about Turks and Caicos luxury Villas and Resorts. This island chain came to the Caribbean destination table a little later than a lot of other islands and so had the intelligence and foresight to cherry-pick all of the elements that inter-weave to make luxurious and natural Caribbean-style holidays a dream experience. 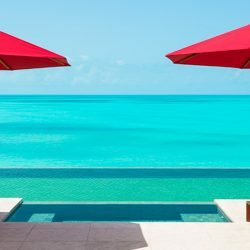 From small decisions that don’t allow fast-food conglomerates to proliferate across its islands, to ensuring that hotel and resort developments work in tandem with the natural beauty of this sublime location; it’s no wonder that Turks and Caicos is the destination of choice for anyone looking to embrace the glories of nature from luxurious surroundings. Relax on the sugar-fine sandy beaches here in TCI, overlooking the Caribbean Sea. Resorts … There’s One for Everyone! I like to break up my suggestions of the best resorts in Turks and Caicos into a few different categories. For instance, you might want the alI-inclusive experience. You might, of course, be that couple seeking an intimate honeymoon experience. Perhaps you are the action-packed family who love to hit the ground running and want lots of fun activities. There is a resort for everyone on these wonderful islands, providing some of the best things to do in Turks and Caicos. At Exceptional Villas, our decades of experience allow us to match you to your perfect resort. We gauge what villa or hotel will offer you, not just a list of factual requirements, but the full emotional package that will embrace everything that makes a holiday truly unique to you. For instance, a sense of privacy, an unbeatable view from your terrace each morning, access to a beach so you can start and end each day with a splash, fun nightlife… whatever it is that lights that spark of true relaxation and enjoyment for you, our talented sales and concierge team can unlock the perfect Turks and Caicos experience for you. The islands are really in the Atlantic, southeast of the Bahamas but in every respect they are Caribbean in both climate and personality. Turks and Caicos is a collection of 40 low lying coral islands. The main island is called Providenciales or Provo and is where a significant amount of the T&C tourism is centralised. It is a starting point to some of the other inhabited Cays or islands that surround it. 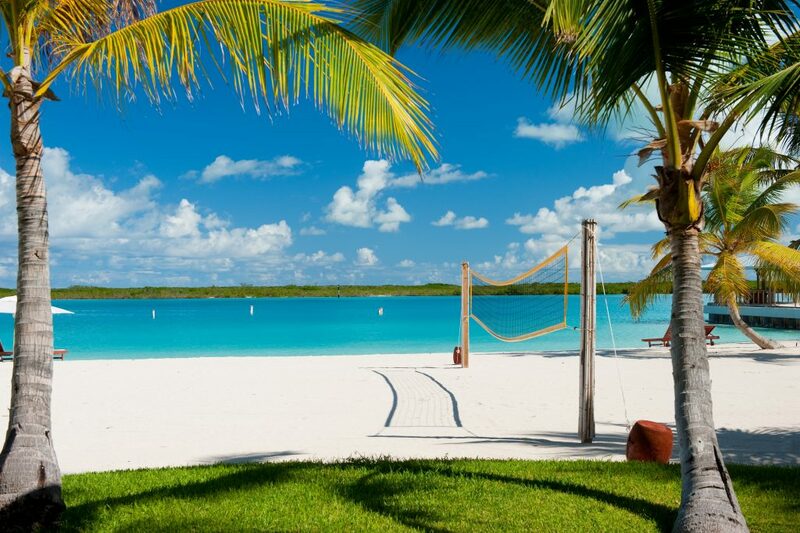 Read our Turks and Caicos Travel Guide for more information. Grand Turk island is the administrative capital of this British Overseas Territory and has the historic town of Cockburn as its capital. Moving between the islands is achieved by plane or boat in a very short space of time. 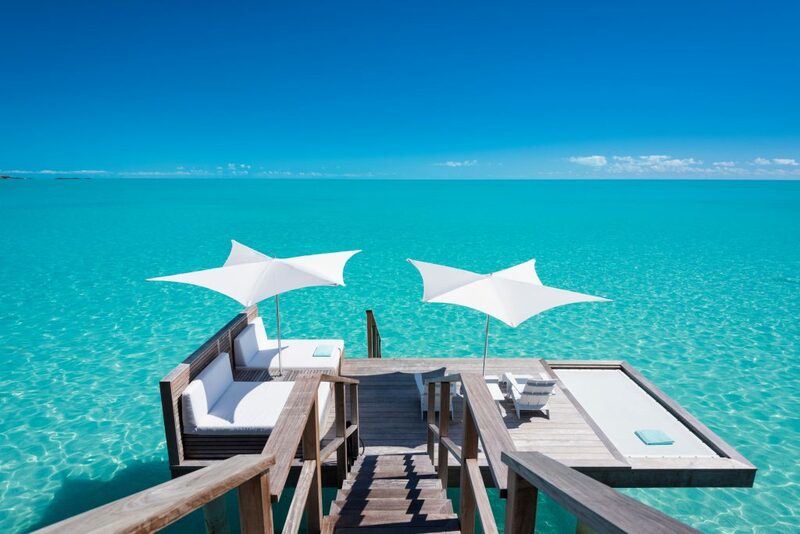 Now let me formally introduce you to some of the very best resorts in Turks and Caicos. If there’s one thing that is in plentiful supply it is the number of 5 star resorts Turks and Caicos has to offer. The level of luxury and casual elegance built into the various resorts that line Grace Bay, for instance, caters to the needs and tastes of guest of all ages. 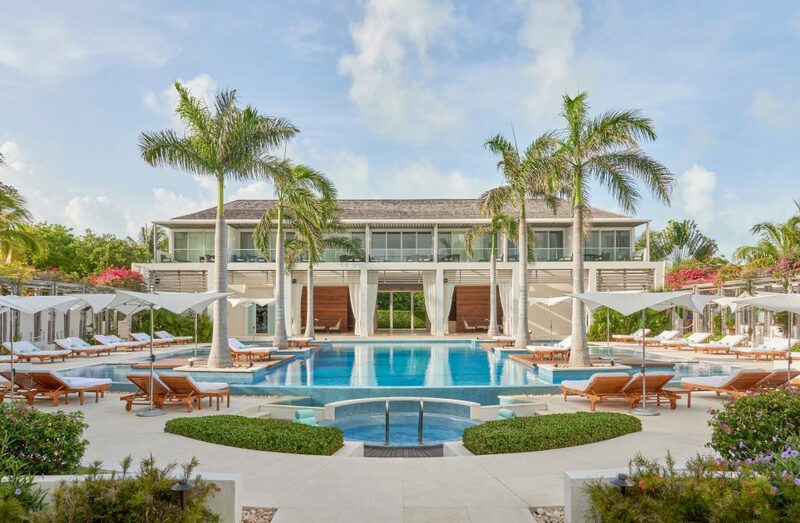 The Wymara Resort in Turks and Caicos is a series of beautiful contemporary suites that offer breath-taking ocean front locations along the gorgeous Grace Bay. With spacious air-conditioned bedrooms, private terraces and access to all of the facilities of the Wymara Resort, guests can enjoy the Exhale Mind Body Spa, have complimentary access to the fitness centre, enjoy award winning dining at Stelle, the Asian Fusion restaurant. The 7,000 sq. ft infinity pool that is the focal point for the resort is the place to unwind each day and enjoy casual dining and award-winning service. The Villas at the Wymara Resort are a collection of stunning luxury homes located in Turtle Tail area which offer the most incredible views, location and above all – luxury, The villas also have complimentary access to the Wymara Hotel on Grace Bay as well as all of the facilities. Your villa has its own fully-functioning kitchen that allows you to enjoy private dining at home on those days when you just don’t want to leave the luxurious surroundings of your gorgeous villa. All of this on the edge of the Caribbean Sea. 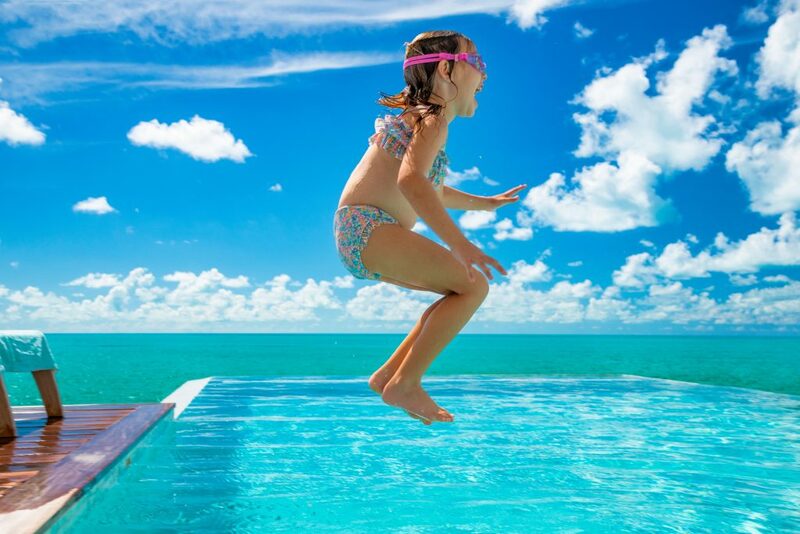 One of the best Turks and Caicos resorts when travelling with children has to be The Somerset. 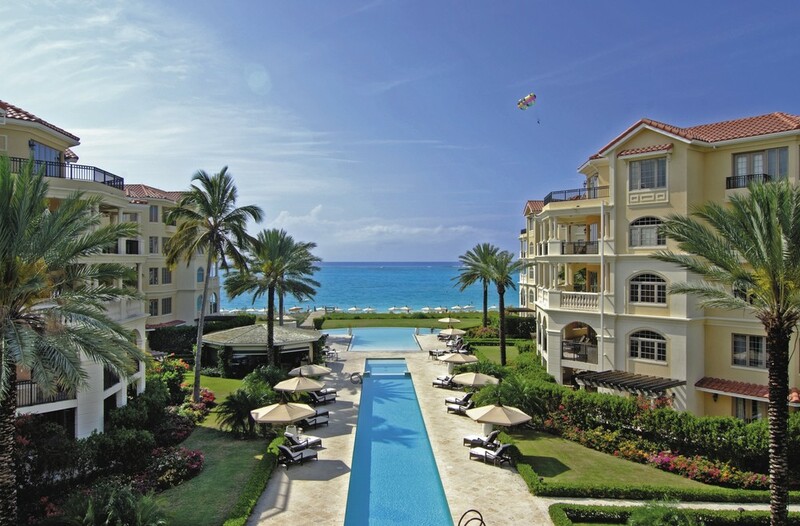 This is one of the newer resorts that has sprung up along the famed Grace Bay beach. A short distance from the main town of Providenciales, this self-contained resort has beautifully appointed villa accommodations that suit guests who enjoy traditional luxury and with a colonial vibe. The dedicated Caicos Kids Club is well-organised and can offer your 5-12 year olds so many fun activities. As well, on select evenings the Kids Club hosts a dinner for the younger folks. A lovely opportunity for the adults to have a more grown-up dining experience knowing their kids are having a wonderfully social experience. The Somerset Turks and Caicos hosts a get-together on Monday’s where the Manager welcomes guests with live music, complimentary cocktails and tapas. The regular beach BBQ each Tuesday is another opportunity for guests and their families to mingle in a casual setting. The Resort has a gorgeous spa and fitness centre, access to numerous sport and recreation activities on and off the water. Another wonderful choice for families is Windsong. A luxurious Turks and Caicos beach resort that has very easy access to the coral reef that sits just off Grace Bay shore. This fabulous resort boats 53 architecturally diverse accommodations that capture beautiful contemporary British West Indies style with all modern amenities. Windsong Resort Turks and Caicos is also an ideal destination wedding venue. The property is ideally suited to host your very special day. There is a lovely bridge over the central pool area. The spa is sublime as well as the dedicated fitness area. 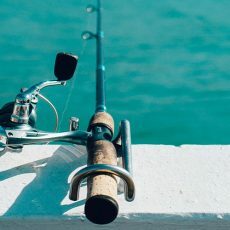 The resort offers all of the usual sports amenities for guests who want to get out onto the water. The grounds are immaculately maintained and its location on the edge of Grace Bay make it perfect in every way. 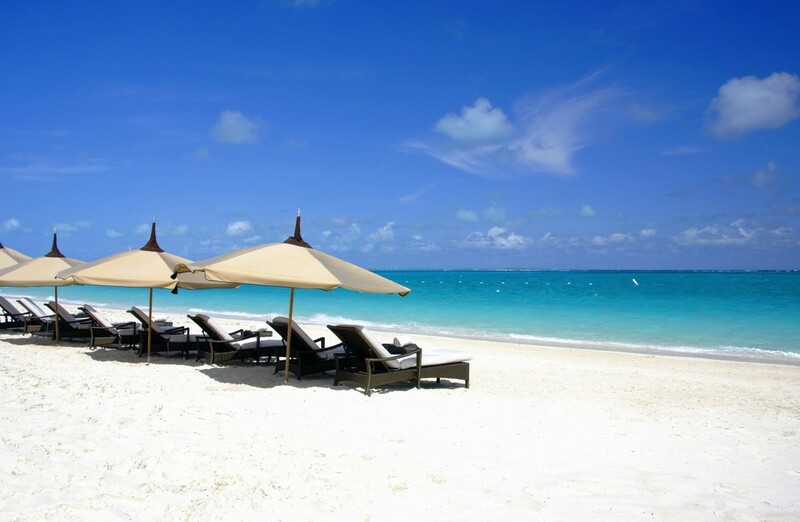 In you are looking for the ultimate in Turks and Caicos all inclusive resorts then you will be spoiled for choice. In addition to Windsong and The Somerset discussed above, you could try the majestic Blue Haven. Blue Haven is on the Leeward side of the island of Providenciales. It’s a short distance away from the hubbub of Grace Bay making it the perfect place to enjoy a quieter vacation experience. 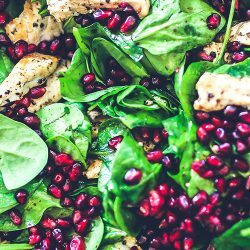 The all-inclusive package allows you and your party to enjoy all of the delicious meals prepared to the highest of standards. There is a lovely fluid arrangement with your meals in that you can have your breakfast down on the beach or in your spacious suite. And on the subject of the beach … it’s private. You have a long stretch of the whitest powder-fine sand that is unfurled against a bluey-green sea. Blue Haven has a complimentary shuttle that will let you sample the services of its two sister properties located right on Grace Bay: Alexandra Resort and the adult only, Beach House. The Fun Pals kids club offers entertainment and adventures for younger guests so you can truly relax knowing everyone is safe and supervised. Don’t forget to kayak over to Iguana Island and see the curious inhabitants who will scuttle up to say ‘hi’. It never fails to raise a squeal or two of excitement from kids… and adults! My next suggestion is the fabulous 7 Star Resort Turks and Caicos. This well-established resort has a prime location along the award-winning Grace Bay beach. Luxurious suites with kitchen facilities, offer beautiful sumptuous furnishings that create the sophisticated but ultra-comfortable backdrop to your dream vacation. The landscaping around the resort sees a proliferation of mature palm trees that create a natural barrier between the pool area and the beach. You will enjoy a sense of privacy and seclusion yet being only a few yards from the perfection that is Grace Bay. Dining in the heavenly surroundings of Seven, with tables lit by candle light, is probably one of the most romantic aspects of this property. If you are that honeymoon couple who want to feel special, the surroundings and top-class attentive service, will deliver all of this for you. The kids club, fitness centre, water sport activities, yoga, tennis … you name it … it’s all at the Shore Club just waiting for you. The Shore Club located on Long Bay Beach a short hop from downtown Providenciales, is one of the most beautiful resorts on the islands. The Mediterranean feel of warm creamy marble and classical architecture features create spacious and airy villa accommodation set on a large and private estate. The Shore Cub is the best luxury resort in Turks and Caicos for that sense of self-containment. With four pools, access to the beach, a spa that offers outdoor massages and treatments to the lovely dining options for guests, not forgetting the dramatic design of the Rope Bar, the entire Resort is designed to be a place for guests to truly unwind. There is a glamour to life at The Shore Club but never an unwieldy formality. I love South Caicos. After the heady buzz of Provo and Grand Turk, South Caicos offers a quieter vacation experience closer to nature. The place to base yourself is unquestionably Sailrock Resort. This resort has villas scatters around its main house, each one enjoying an unimpeded sea view. Sailrock Resort Turks and Caicos is the launch pad for snorkelling around the coral reef, diving, fishing, paddle boarding. Hire a boat and explore around the Cay and find quiet beaches for a romantic or family picnic. If you enjoy cycling, the Resort can provide bikes so you can get out and explore this island. In comparison to Provo and Grand Turk, there are vast stretches of island that are untouched. In fact, there is a rather large donkey population that live a very peaceful and harmonious existence on South Caicos. The pace of life is slow and mellow. The Great House Restaurant and Cove Restaurant offer a varied menu that focuses on delicious seafood dishes. There’s plenty of choice for all palates. There’s nothing as lovely as taking your after-dinner drink out onto your Villa’s terrace and looking at the vast constellation of stars that will adorn the night sky. 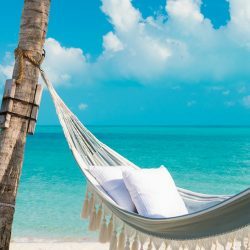 Don’t forget, Turks and Caicos enjoys up to 350 blue sky days each year and that translates into cloudless, star-filled skies at night! Sometimes, getting away means just that. Completely stepping away from the bustle of life and unravelling in an earthly paradise. 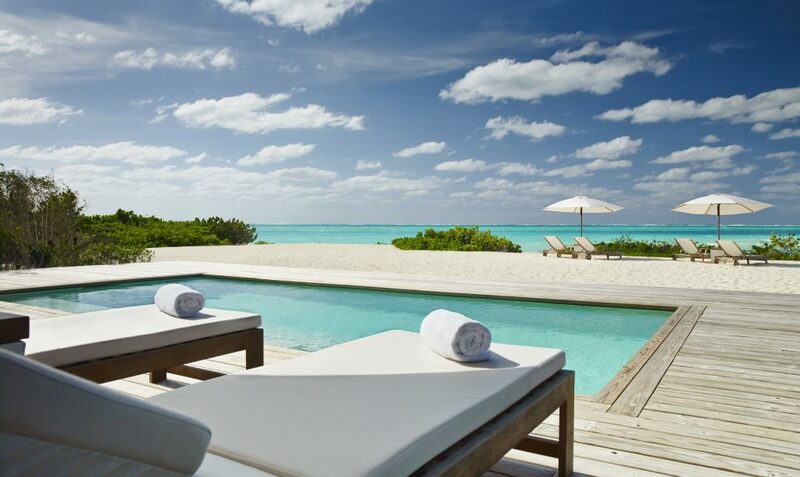 One of the most luxury Caribbean resorts Turks and Caicos has to offer is Parrot Cay. A short boat trip from Providenciales will find you stepping onto the prettiest and most secluded islands in the whole island group. It also holds a profusion of delicious dining opportunities in some of the best Turks and Caicos Restaurants. Parrot Cay Turks and Caicos is private. No boating day trippers can come ashore. Once you arrive, you and the select others can enjoy world-class, opulent accommodations from beach front villas, private estates, to beach houses distributed across the 1,000 acres that comprise the footprint of this island. Each property is truly secluded. Parrot’s Cay is ideally suited to celebrities who want to unwind without the telephoto lens invading their downtime. It’s perfect for that busy family whose business interests keep them apart for most of the year – it allows the space and time for everyone to hang together in such a safe and beautiful setting. The private estate, The Sanctuary, is the jewel in the crown of Parrot Cay Turks and Caicos. This stunning property is owned and furnished by the stylish Donna Karan and is the last word in glamour and luxury. The discrete and professional staff, who will prepare each day on Parrot Cay to suit your timetable know how to care for you without invading your personal quiet time. You can enjoy lazy brunches on the terrace, candlelit suppers, packed picnics if you decide to explore the coastline by boat. Early morning swims along your mile of private beach. There’s nothing missing from this incredible island. It will deliver a memorable and bespoke vacation experience. This is the very briefest introduction to some of the Turks and Caicos islands resort destinations. For the full roll call of incredibly resorts, villas and suites, visit our Exceptional Villas website where you can explore each property and learn about the luxurious finishes and fabulous amenities that await you. There is more than one top Turks and Caicos resort. In fact, they are all pretty top notch. All you need to do is allow us to guide you to the perfect destination that can delivery the ideal holiday experience for you. 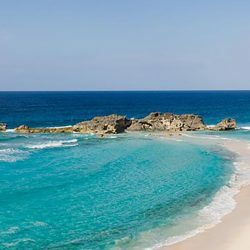 From the fun of the Provo Fish Fry, to visiting Iguana Island, beach combing along Grace Bay or snorkelling on the third largest coral reef in the world, Turks and Caicos is a destination that has it all! With 350 sunny days each year, it’s no surprise that T&C is an all-year round destination. 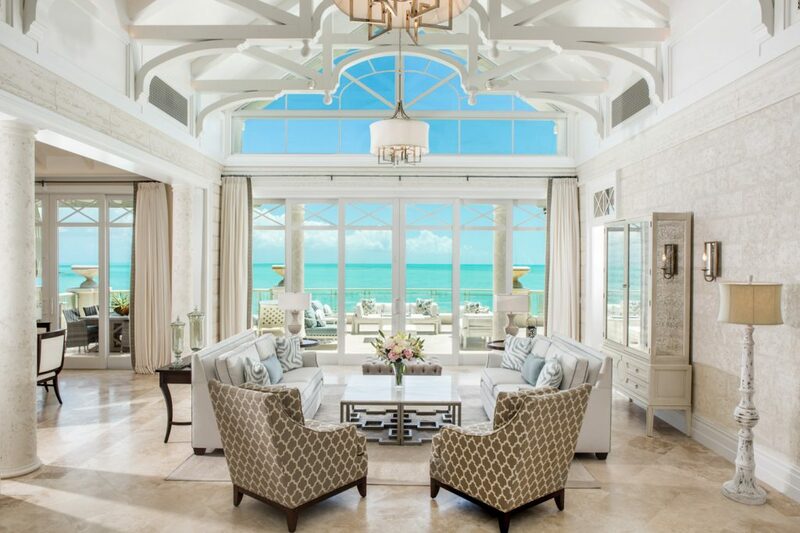 Luxury has found a home and it’s on Turks and Caicos. Come see for yourself! Hey, Mairead! The Caribbean is one of my favourite places to go for a vacation and relax. I have been to many places in the Caribbean, bit Turks & Caicos is still unexplored. Thank you for sharing this wonderful blog on the resorts.